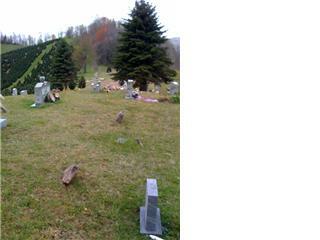 Morgan Branch Graveyard is just a short drive from Dark Hollow Cemetery in Roan Mountain, Tennessee (Carter County). However, the road can be treacherous, especially at night. To get to the graveyard, you also travel on the fabled Teaberry Road. As like Dark Hollow, a majority of the graves are nothing more than old, unmarked stones. There is a difference though. The old graves are mixed in throughout the whole graveyard with the more recent ones. I haven't been able to dig up any information for any specific hauntings at this place, though unusual activity has been reported. Rumor has it that Morgan Branch is so crowded, that there are graves on top of graves. From our initial two visits to the site, that doesn't seem so far fetched. Unusual sounds and lights have been reported coming from here at night. We then returned around 10:00 P.M. We stayed in the graveyard about twenty minutes. Although we did not specifically encounter or see anything, we did hear weird sounds coming from in front of us, such as a groan. One strange thing that did happen was all of a sudden all the dogs in the neighborhood started barking. Then stopped just like that. That did not make us feel better about being in the graveyard. We took several pictures. I took one of some graves up ahead next to a tree. Chris saw an orb after the flash of the camera went off. Throughout the graveyard we had a feeling of uneasiness and a feeling of being watched/followed. I think I furthered that notion for Chris when I accidentally tripped over a grave. He thought I was running away from something. At the gate to the graveyard we found a cold spot. Chris's right side went numb, while the left stayed warm. There are two questionable places on the voice recorders that could be EVPs. We will look further into and get them up ASAP.